i love summer for all the barbecuing and salads and outdoor eating. we usually only bbq on weekends or holidays because a) that’s when my husband can be home from work all day, and b) the recipes we make for barbecuing and smoking usually take quite a bit of time and prep. 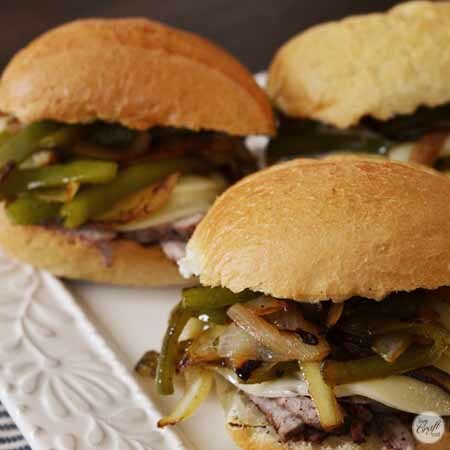 this recipe for philly cheese steak sandwiches, however, is not only nice for a simple and quick weeknight dinner, but it is also nice to your wallet. before we get started on this super easy process, let’s consider the cost of all these ingredients. while going to a restaurant and ordering a cheese steak sandwich for everyone in your family might be fun, it’s never fun to spend a ton of money on something that you can easily make at home for much less of a cost. please note that while looking at my numbers below, i did not buy anything on sale. so if you can find a great deal on steak, you could be in for a super cheap meal. also, recognize that food prices differ in different places. where i live now, compared to places i’ve lived before, i consider the food relatively inexpensive. so keep in mind the cost of living/buying food where you are. the steak was $9.99/lb so i got just under 1 pound for 4 people. it was thin-cut boneless new york strip steak which i like because it cooks so much faster than a thick piece of steak. if you really want a cheap meal, buy your steak on sale, or go for a different and slightly cheaper cut of steak like top sirloin. we used 2 slices of provolone per sandwich. all of which works out to $3.36 per person/sandwich…a sandwich with steak, no less! compare that to your local philly cheese steak restaurant – it’s definitely much cheaper to make your own! 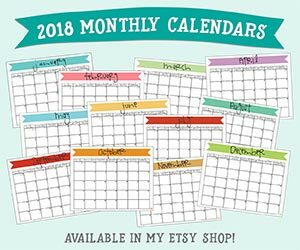 now all you need to do is make them. slice your green peppers. chop your onion in half and then slice your onions. 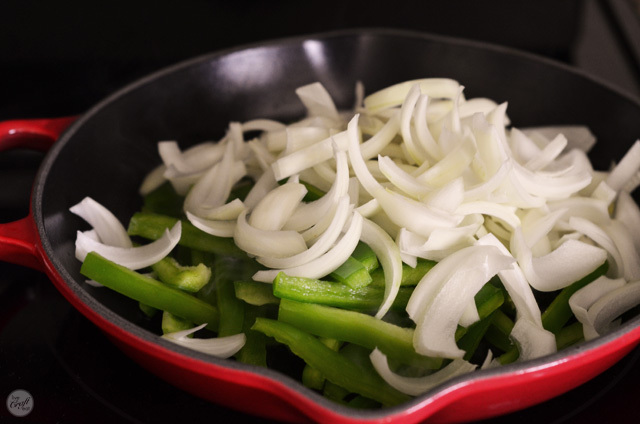 both the peppers and onions should be about 1/4-inch thick or so. heat 1 tablespoon of oil in a skillet over medium heat. sautee the peppers and onions until soft. if you’re adding mushrooms, slice them and add them to the pan a few minutes after the onions and peppers. season everything with salt and pepper. 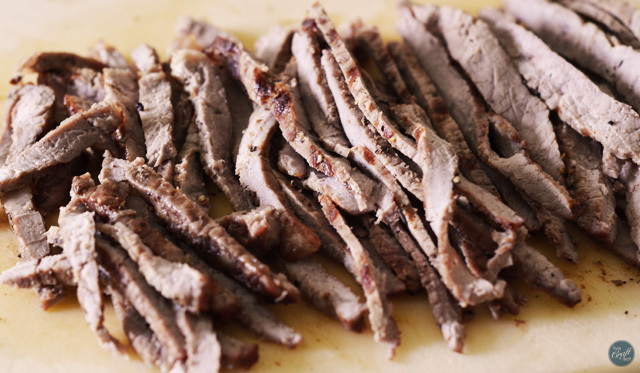 for the steak, we like to keep it simple. we just brush both sides with oil and season with salt and pepper. the reason you want to brush some oil on first is because oil is a great flavor conductor and helps the seasonings or whatever else you’re using infuse itself into oil and therefore the meat. (think marinades and salad dressings…they all use oil.) grill the steaks on your bbq or sear them in a skillet, just a few minutes on each side until they’re done the way you like them, then slice thinly. now that your meat and veggies are done, it’s time to toast your rolls and layer the steak, provolone cheese slices (2 per roll), and peppers, onions, and mushrooms. and that’s seriously all it takes! my husband loves, loves, loves these, and they are super filling, so 1 per person is plenty! 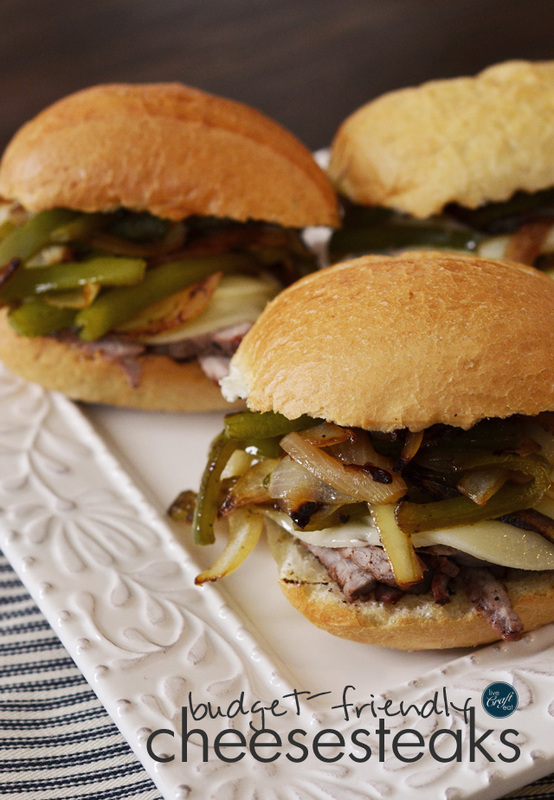 so the next time you have a craving for a cheese steak sandwich, try out this simple homemade, cost-effective version. we think it’s a winner! 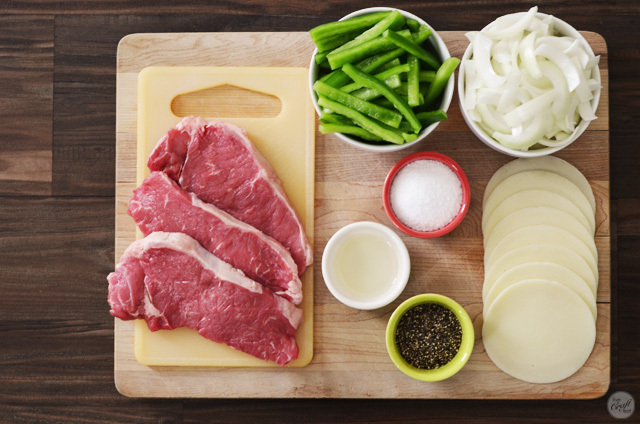 season steaks by brushing both sides with oil and seasoning with salt and pepper. grill for a minute or two on each side. slice thinly. heat 1 tablespoon of oil in a skillet on medium heat. sautee onions and peppers until softened, about 5 minutes. add mushrooms and continue to cook for a couple minutes more, until all the vegetables are soft and starting to turn brown. 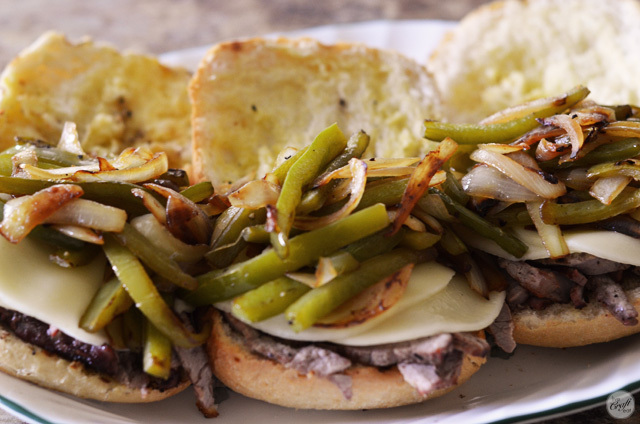 toast rolls and layer with steak, provolone, and vegetables. enjoy!